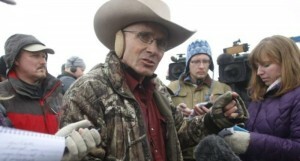 (Reuters) – The fatal shooting of Robert “LaVoy” Finicum, one of the armed protesters who took over a federal wildlife refuge in Oregon in January, was “justified and necessary,” a county prosecutor said on Tuesday. Finicum was shot and killed by Oregon State Police on Jan. 26 after he tried to flee a traffic stop on a snow-covered roadside during the armed occupation by lands rights protesters of the Malheur National Wildlife Refuge. Relatives of Finicum, 54, a spokesman for the group that seized buildings at the refuge, have previously said that he posed no threat and have rejected official assertions that he was armed when he was killed. Speaking at a press conference in Bend, Oregon, Malheur County District Attorney Dan Norris said eight shots were fired at Finicum during the confrontation, six of them by Oregon State Police officers and two by FBI agents. Three of the bullets fired by Oregon State Police officers led to his death, he said. “The six shots fired by the Oregon State Police were justified and in fact necessary,” Norris said. Deschutes County Sheriff Shane Nelson said a loaded 9mm handgun was found in the pocket of Finicum’s jacket following the shooting. Nelson said Finicum was struck in the back by three of the bullets fired by state troopers who were behind him as he appeared to reach for that weapon. The takeover, which began on Jan. 2, was sparked by the return to prison of two Oregon ranchers convicted of setting fires that spread to federal property in the vicinity of the refuge. The leaders of the standoff, Ammon and Ryan Bundy, were arrested at the same traffic stop at which Finicum was slain.